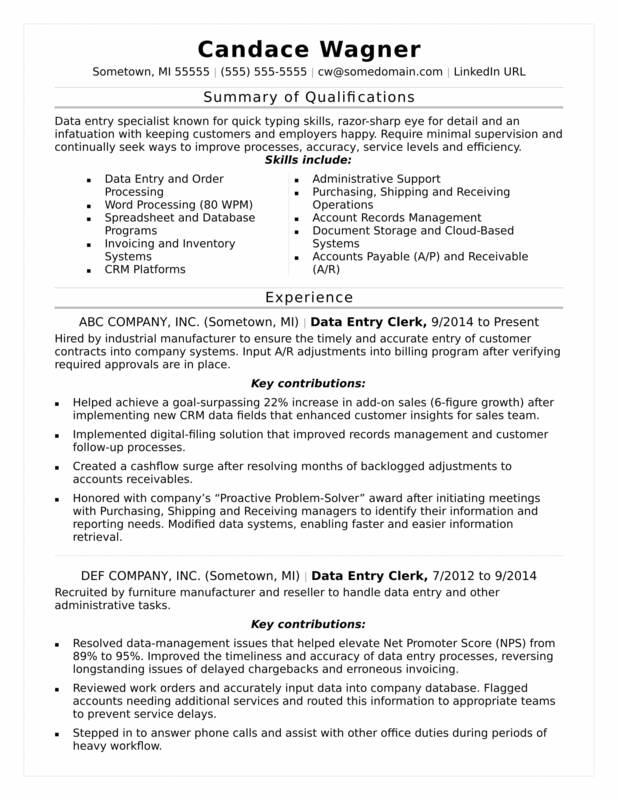 View this sample resume for data entry, or download the data entry resume template in Word. To be considered for top data entry jobs, resume expert Kim Isaacs says it helps to have a resume that shows off the most compelling facts and figures about your skills and work history. For resume writing tips, view this sample resume for data entry that Isaacs created below, or download the data entry resume template in Word. And if you need more help, get a free resume evaluation today from the experts at Monster's Resume Writing Service. According to the Bureau of Labor Statistics (BLS), you'll find the highest level of employment for this job in the following states: California, Texas, Florida, New York, and Illinois; and in the following metropolitan areas: New York City, Los Angeles, Chicago, Dallas, and Houston. As a data entry worker, you can expect to earn a median wage of $30,930 per year, or $14.87 per hour, according to the BLS. Search for data entry jobs on Monster. Data entry specialist known for quick typing skills, razor-sharp eye for detail and an infatuation with keeping customers and employers happy. Require minimal supervision and continually seek ways to improve processes, accuracy, service levels and efficiency. Hired by industrial manufacturer to ensure the timely and accurate entry of customer contracts into company systems. Input A/R adjustments into billing program after verifying required approvals are in place. Helped achieve a goal-surpassing 22% increase in add-on sales (6-figure growth) after implementing new CRM data fields that enhanced customer insights for sales team. Implemented digital-filing solution that improved records management and customer follow-up processes. Created a cashflow surge after resolving months of backlogged adjustments to accounts receivables. Honored with company’s “Proactive Problem-Solver” award after initiating meetings with Purchasing, Shipping and Receiving managers to identify their information and reporting needs. Modified data systems, enabling faster and easier information retrieval. Recruited by furniture manufacturer and reseller to handle data entry and other administrative tasks. Resolved data-management issues that helped elevate Net Promoter Score (NPS) from 89% to 95%. Improved the timeliness and accuracy of data entry processes, reversing longstanding issues of delayed chargebacks and erroneous invoicing. Reviewed work orders and accurately input data into company database. Flagged accounts needing additional services and routed this information to appropriate teams to prevent service delays. Stepped in to answer phone calls and assist with other office duties during periods of heavy workflow.